Be sure to have a great exterior sign! 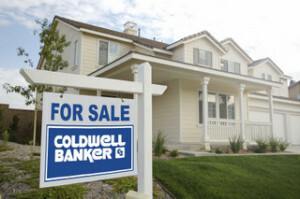 Residential and commercial real estate signs can make the difference between a quick property sale and one that takes a long while to negotiate. Acting like a cross between a business card and a point of purchase signage product, the variety of signs you may choose from fit each property type currently in your inventory. Do potential buyers or sellers easily find your office? A cabinet sign makes an ideal realty marker. Add vinyl window lettering to post your office hours and contact information for the times that you are out showing homes or commercial properties. Some of our most successful real estate professionals also rely on printed posters that highlight their latest listings with just enough detail to make consumers stop in and ask questions. We can also help with commercial real estate signs! 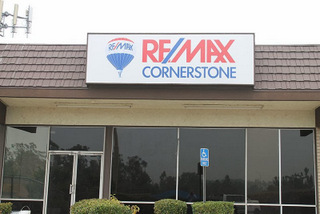 The typical commercial property sign features wooden stakes and a large aluminum surface. A vinyl overlay shows off your company’s colors and provides detailed information. We recommend the use of an anti-graffiti laminate to protect the signage against vandalism. Window lettering allows you to make good use of large glass panes around the commercial building’s façade. Get even more attention by hanging a banner from a building to invite interested buyers to contact you. When you are selling a plot of land, consider the use of a V-shaped sign that markets to motorists coming from all directions. You are undoubtedly already familiar with real estate professional yard signs that you would post as soon as you list a home for sale. When you host an open house event, add a sidewalk sign to slow down foot traffic and invite in some consumers who may not have initially planned to visit. Additional “open house” notices take on the form of yard signs that you might stick into the median along the street or simply into the yard of the property. Some professionals have had excellent success with flutter flags as well. 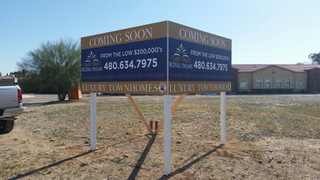 Ask us about residential real estate signs! The experts at Spotlight Signs and Imaging Solutions help you to get noticed. We serve the business communities in and around Gilbert, Chandler, Mesa, Tempe, Scottsdale and Phoenix. We help you to design your first signs or provide you with the signage required by a franchise. In addition, we work with you on budget-friendly solutions that allow you to hit the ground running and then build on your signage inventory from there. Call us today to get started on your order. We also hope you'll check out our webpage all about property management signs!